The installation meeting of Fleetwood Lodge No 3711 welcomed the third generation of the Brooks family to be installed into the chair of King Solomon, making the installation a truly family affair. George Brooks was extremely pleased to be in the master’s chair to install his grandson Glen Brooks. David Randerson (left) congratulates Glen Brooks. 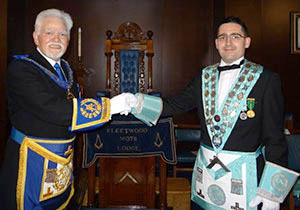 George having completed two years as master in order to allow Glen the chance to progress through the offices of the lodge so he would be in the master’s chair for this very important day. To help celebrate this, 48 members and guests gathered at Fleetwood Masonic Hall and were pleased to have Assistant Provincial Grand Master David Randerson as their principal guest. David was accompanied by grand officers including North Fylde Group Chairman Peter Greathead, Stuart Thornber and Ted Vollans, as well as acting Provincial grand officers; John Anderson, Mike Pinkard, Jason Dell, Gary Norris and John Pitches. The three generations of the Brooks family: George, WM Glen and David. Once David had been received and welcomed by George, he was offered the gavel of the lodge. David responded by thanking George and saying that it was an honour to be offered the gavel of any lodge as is his by right, but on this occasion, David agreed that on this special occasion the rightful place for the gavel was in the hands of George. George started the installation by asking Andy Curtis to occupy the chair of senior warden, Jonathan Moss to occupy the chair of junior warden and Peter Tebbs to act as installing inner guard. 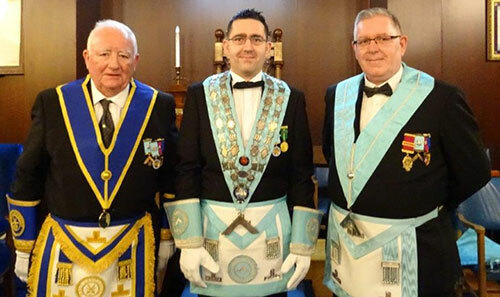 What followed was an impressive ceremony of installation with Glen’s father David having the honour of presenting him as master elect for installation. The presentation of the working tools was delivered with the utmost sincerity. The third degree tools were delivered by Ian Glass, followed by Nick Cutting delivering the second degree tools and finally Steven Bozorth delivering the first degree tools. The address to the master was delivered with expertise by Jason Dell. It was then time for the new master to install and invest his officers and once the wardens were installed Chris Carnell duly delivered the address to them. The hard-working director of ceremonies Peter Ward delivered the address to the deacons, leaving the final address to the brethren of the lodge in the more than capable hands of David Randerson. Once the director of ceremonies announced: “That concludes the ceremony of your installation.” David Randerson, as is customary at this point of proceedings, rose to bring the greetings of Provincial Grand Master Tony Harrison. He complimented not only the newly installed master Glen but also his installing master and grandfather George and the members of the lodge. Before David resumed his seat, Glen had the pleasure of presenting him with cheques for £1,000 to the West Lancashire Freemasons’ Charity, £500 to the 2021 MCF Festival and £100 to St Wulstan’s RC Primary School. David thanked the lodge for such generous donations to charity and on behalf of the ultimate recipients. Picture left: David Randerson(left), Glen Brooks (centre) and George Brooks. Picture right: Steve Willingham (left), Damon Tait (centre) and Ian Glass. The formal work of the evening being ended the brethren retired to the dining room where the festivities and merriment continued, the catering staff laid on a fine feast for the assembled brethren, washed down with generous amounts of wine. In response to the toast to his health, David brought his own greetings to the new master and noted what a special occasion it had been to have both grandfather and father involved in the ceremony, David said that there were many lodges with a father and son in them, but it was rare to find a lodge with three generations. David added to the delight of the brethren that George had his own special way of delivering the ritual. 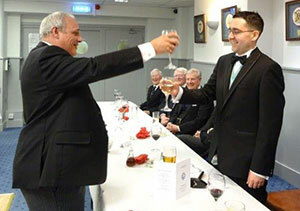 David also thanked the brethren who had taken part in the ceremony. David continued by noting that Glen had some learning issues and said that he would have not known that from the way he conducted himself. He added that Glen’s wife has had some health issues and for a young man to work and bring up a family was really very special, and that credit was due to him and that the lodge should be proud of him. Continuing on, David noted the article in Freemasonry Today from Dr David Staples the Grand Secretary, saying that Masons are not isolated and must involve family and brethren couldn’t do what they did without their support. He said brethren should be open and proud about their Masonry. In the same vein David mentioned the membership Pathways scheme which had been created to help lodges plan for their future and to take men who are interested in Freemasonry, but not yet a member, on a journey to becoming a committed master Mason. John Darrell (left) toasts Glen Brooks during the master’s song. David moved on to the subject of Solomon, a great new on-line learning tool from United Grand Lodge of England, that is there to support members make a daily advancement in Masonic knowledge. It is also there to support lodges and chapters by providing short lecturers or nuggets that can be presented to brethren when a lodge has no ceremonies to perform. David’s response moved to the subject of the 2021 Masonic Charitable Foundation Festival saying that brethren must do their best to support and wear their jewels with pride, it being there to support members, their families and charities. He reported that every year the Province of West Lancashire receives over £1,000,000 from the foundation. David spoke about the Royal Arch. He said that Masons should consider the Royal Arch before moving to other degrees, it being the fourth step in Freemasonry, a colourful degree and a gateway to other degrees. Finally, David thanked the group publicity officer Peter Dunn, the acting officers for all their hard work and support throughout the last year, Peter Ward the director of ceremonies and Chris Carnell, Fleetwood Lodge’s secretary. The master’s song was rendered by John Darrell accompanied by David Brown, whose mastery of the organ cannot be denied. In a touching moment to the evening’s festivities, Glen presented David with flowers for his wife. David responded by saying how much his wife loved flowers but, on this occasion, he gave the flowers back to Glen to take home for his wife in respect of the support she had given him. A raffle held during the evening raised a magnificent amount of £265 which is a great start to the new master’s year. Pictured from left to right, are: John Anderson, Mike Pinkard, Peter Greathead, Stuart Thornber, George Brooks, David Randerson, WM Glen Brooks, Jason Dell, Gary Norris and John Pitches.